Why See Enrique Guzman, Angelica Maria, Alberto Vasquez and Cesar Costa? Four pioneers of Latin rock & roll come together at this very special concert. 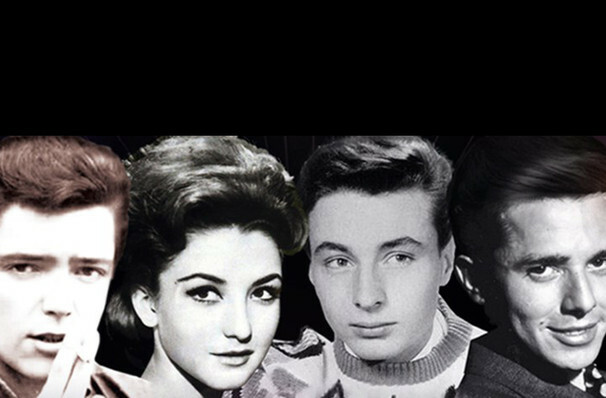 Enrique Guzman, Angelica Maria, Alberto Vasquez and Cesar Costa all rose to fame in the 1950 and 60s, through both their records and their appearances on the big screen and in telenovelas. They've been giants in Latin pop culture ever since, and it's a real treat to see them all on the same stage. Expect to hear some of their biggest hits (and they've got plenty to choose from! ), such as 'Pensaba en ti', 'Besos por telefono', 'Bambina bambina', 'Lo que sabemos del Amor' and many more! Sound good to you? 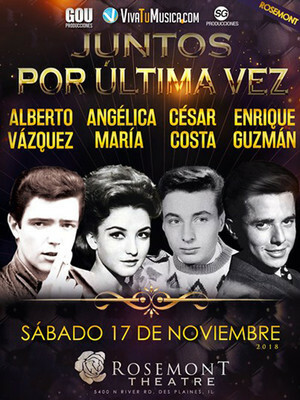 Share this page on social media and let your friends know about Enrique Guzman, Angelica Maria, Alberto Vasquez and Cesar Costa at Rosemont Theater. Please note: The term Rosemont Theater and/or Enrique Guzman, Angelica Maria, Alberto Vasquez and Cesar Costa as well as all associated graphics, logos, and/or other trademarks, tradenames or copyrights are the property of the Rosemont Theater and/or Enrique Guzman, Angelica Maria, Alberto Vasquez and Cesar Costa and are used herein for factual descriptive purposes only. We are in no way associated with or authorized by the Rosemont Theater and/or Enrique Guzman, Angelica Maria, Alberto Vasquez and Cesar Costa and neither that entity nor any of its affiliates have licensed or endorsed us to sell tickets, goods and or services in conjunction with their events.